Mai Chau, a small town in th e northern province of Hoa Binh was named by the US Business Insider as among the top ten incredible places for cultural tours. Just three hours outside of the capital Hanoi , Mai Chau is a mountainous region dotted with traditional stilt houses. Two ethnic minority groups – the White Thai and Black Thai – make up the majority of the population there, Business Insider reported. 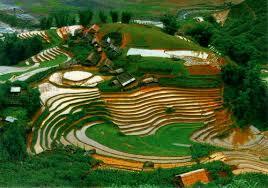 Mai Chau was also named one of the top ten “fresh” Asian destinations by hotel booking site Agoda.com.